I have been getting the delightful ‘bonnie wee oatcakes‘ snack pack from Graze. I was curious to see if it was easy to make myself. 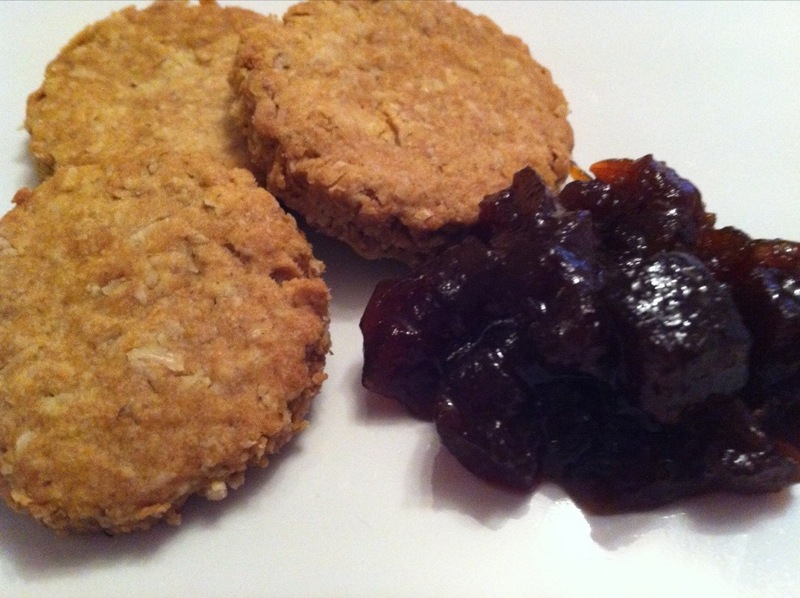 Essentially oatcakes are savoury crackers that are perfect with cheese and relish. You need to combine all the dry ingredients and then rub in the cold butter (just like scones). When the butter has disappeared pour in the water a little at a time, I would go very gingerly with this because it does not take much at all. It will form into a thick dough, from there you just need to roll to half a cm and cut into desired shapes. Then bake at 190C for 20 minutes or until they are golden brown. The above quantities made about 14 little crackers. They were too rich to eat on their own – but with a sharp cheese and tangy/sweet relish they were perfect. The only downside was the supermarket bought balsamic onion relish that I had. It didn’t have the best flavour, but I just didn’t have time this weekend to make my own!